Candles have been burned at several ends smile emoticon in readying the Big Book of Benefits and Mental Health 2016/17 for the printers. Presses are rolling and we hope that the first copies will be available within a week. You can pre-order at our main distributors CPAG . the switchover from DLA to Personal Independence Payment (PIP) started last October and runs until March 2018, so we are upping the help in our PIP chapter to help people through the switchover and to make an appeal if needs be, with new PIP caselaw sections. ESA carries on as new kids on the block – US based health multinational Maximus – rescue the crashed assessment process. But the issues with the tests – when you get one – remain and advisers are seeing demand for help with ESA decisions pick up too. Your practical toolkit is fully updated with resources to help now and when Work Related Activity Component is dropped for new claims next April. . 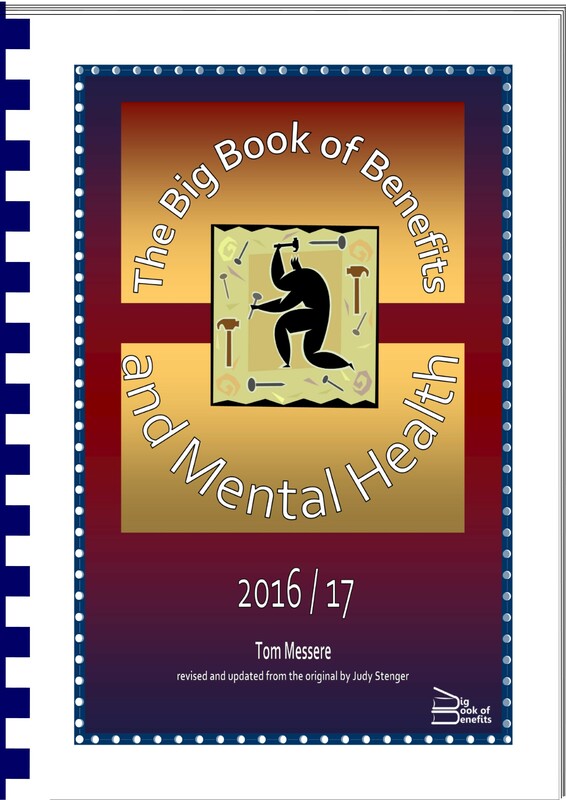 The Big Book of Benefits and Mental Health 2016/17 is available from Child Poverty Action Group bookshop and through all good bookshops. You can find out more about Big Books and linked training – including back by popular demand the very course that led to the book – on this website . Readers of Your Big Book of Benefits 2014/15 – which was a joint project with Your Benefits are Changing – will find this years book is the nearest thing to an update. The two books share many aspects and the same familiar, practical, friendly approach . We hope though, to explore with Community Housing Cymru the potential for a future update of that particular variation. .
As ever we dedicate this 16th edition to the still much missed and loved author of the first 12, Judy Stenger. Her warmth, wit and wisdom still permeate the book through all its changes. And also to all those going through these changes with anxiety, despair , hope, humour and enduring courage. We hope in our own small way, that we too can make a difference. To find out more please see under the Big Book of Benefits and Mental Health page on this website – click here.